GrabHitch welcomes the SwiftBack community! GrabHitch welcomes Swiftback users onto our social travelling platform! As a Swiftback driver, you’ve enjoyed cost-savings and social interactions while sharing rides as a Swiftback driver. Now you can share your ride and be part of GrabHitch’s up and coming social travelling community! Our drivers come from all walks of life and many are regular morning/evening commuters just like you. They choose to give you a Hitch ride as they drive to work or back home so that both of you can save time, share costs and enjoy the comfort of getting a ride instead of having to take public transport. GrabHitch is a social travelling platform on the Grab App that matches regular commuters heading the same way at the same time. Whether you’re a driver with seats to spare, or a passenger who needs a hitch, GrabHitch helps the both of you to share costs and a ride. 4. You MUST enter the referral code SBHITCH to get your $10 credit after you have completed your first GrabHitch ride as a GrabHitch driver! This incentive is only eligible for new drivers who sign up and successfully complete ONE ride as a Hitch driver between 30th November 2016 @ 00:00 hours – 16th December 2016 @ 12:00 hours. New drivers must sign up with the referral code SBHITCH in order to qualify for the $10 credit incentive. The processing of the $10 credit incentive will only be conducted after the incentive period has ended (Post-16th December 2016). 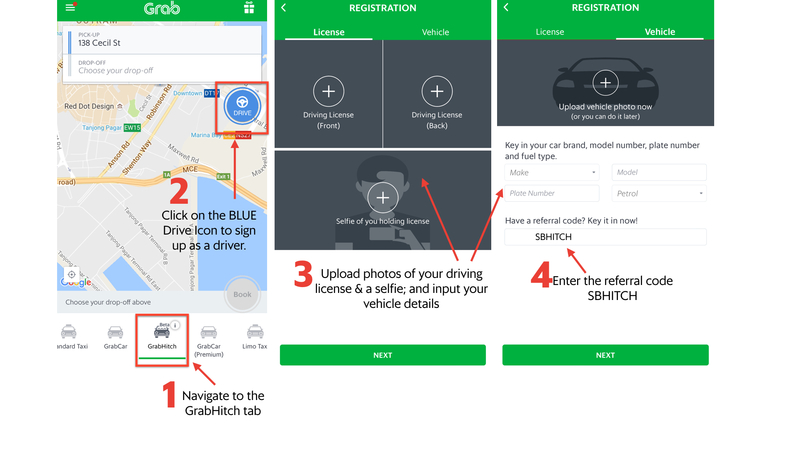 If you’re still not sure how to sign up, or have any questions regarding GrabHitch, email us at grabhitch@grab.com with the Subject: SBHITCH and we will get back to you in 1-3 working days.